A man has been arrested as he tried to flee the police in a pink children's toy car he'd been using for transport. In possibly the best crime scene photograph ever (let's face it, there isn't a lot of competition) David Schumaker was arrested on suspicion of credit card abuse - as he tried to flee in a toy car aimed at children between the ages of five and ten. This wasn't even the last act of a desperate man trying to flee the police, either. According to the San Jacinto County Police, the man, believed to be in his forties, was using the toy car as regular transport. 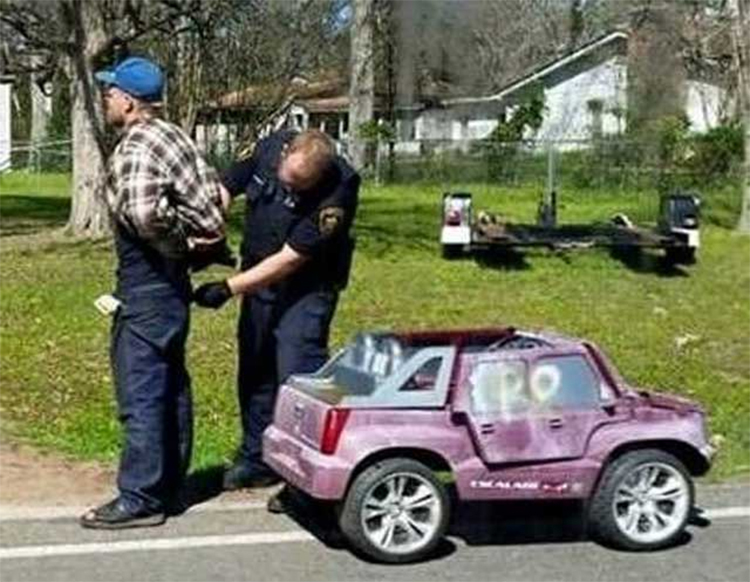 The man was being searched for by local police, who heard reports that he was frequently seen driving around the neighbourhood in the pink toy car (a surefire method to stay under the radar when you're wanted by police). "Yes, that story is perfectly true. We were just as surprised when the report turned out to be spot on. Someone who was passing took the picture and it has caused a lot of amusement." Faster than you think - a similar pink car being used for some serious speed. The man was arrested by police after he ran out of battery and searched for another one, in perhaps the lowest speed chase in police history, thwarting his presumed attempt to cross the border into Mexico. The man is currently in custody on suspicion of credit card abuse. The police have not yet confirmed whether they'll slap a charge of reckless driving on top of that, just for their own amusement.